Our corrugated packaging is specifically customized to the customer's needs or specifications so that no space is wasted and you get a tight fit for maximum protection from damage during shipping of your product. 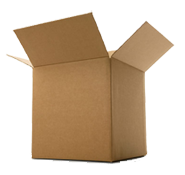 We have all tests of corrugated with three color printing capabilities, so your packaging can represent your company. 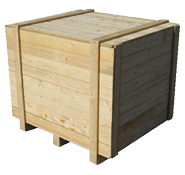 Wooden packaging, crates, and pallets can be expensive when space is wasted. Don't buy a one-size-fits-all solution. We can customize your wooden packaging to your specifications or measurements and ensure that your packaging fits your product or shipment perfectly. Products pictured are for example only. Our products typically come with the vendor's logo or information printed on the boxes/crates. We've all known what it's like to receive a product that has been damaged during shipping. Reduce the likelihood that your customers will receive damaged goods -- no matter how rough the shipping company is on the product! Custom shipping containers made to your specifications are a better fit for your products, have your information prominently displayed on them, and reduce waste or box filler. Contact us to learn more.